The City’s Relief Line study has not been marked by its blinding speed for a combination of political and organizational reasons. For many years, the TTC simply had no interest in a “Downtown Relief Line” claiming that all future demand could be handled on the existing subway network running far greater capacity thanks to the wonders of automation. This position came unglued through a combination of factors including a recognition that even automatic control had its limitations, that the Richmond Hill subway extension was held hostage to the downtown capacity problems, and that heroic attempts to expand existing subway capacity would be very expensive and might not achieve long-term goals. The TTC now accepts that even with improvements in the pipeline, they will run out of capacity on the Yonge line in the early 2030s. At Council, and especially in Mayor Ford’s office, the idea of building any new capacity into downtown was simply not an item for discussion even though the primary beneficiaries would be travellers from the suburbs who would gain capacity to access the growing downtown job market. The 2014 municipal election put everything on hold until staff had a sense of the climate in which any Relief Line study would be conducted. A great deal of effort went into simply explaining that the RL was, in fact, necessary after years of pushing this scheme off of the table. The City’s study looks at three segments of the line: the primary link from the Danforth Subway to the core, an extension northeast to Don Mills, and an extension northwest linking the core to the Bloor Subway near Dundas West Station. Public consultation ran through a long list of options for station locations, and a short list winnowed this down to four permutations of alignments at the downtown and Danforth ends for the first segment. There is not yet a publicly recommended option, but this should appear imminently. It will be no surprise if the proposed line runs from Pape Station in the east to downtown via Wellington Street in the west. However, the challenges lie in how to get from “A” to “B” at least in part because no provision has been made as the city developed along the route of what had been regarded as an unneeded project. Today the focus is on the first segment, although Metrolinx recently published projections showing that a Relief Line north to Don Mills and Sheppard would provide substantial relief to the existing subway system. It is unclear which model the pending report to Council will use in discussion of the route. If the line is pitched simply as a short connector from Danforth to the core, it will not have the same appeal (or long-term effect) as one going much further north. 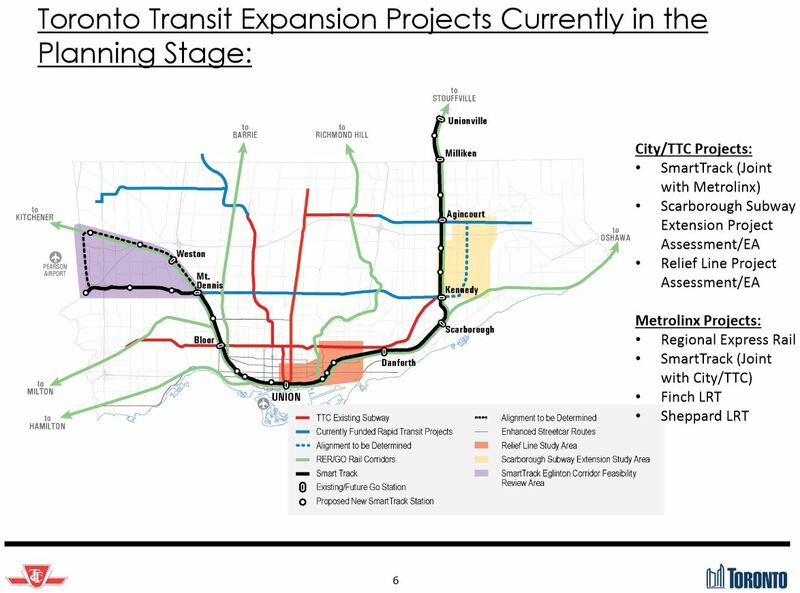 A related question will be whether the new UofT demand model produces similar demand projections for this route as those of the model used by Metrolinx. 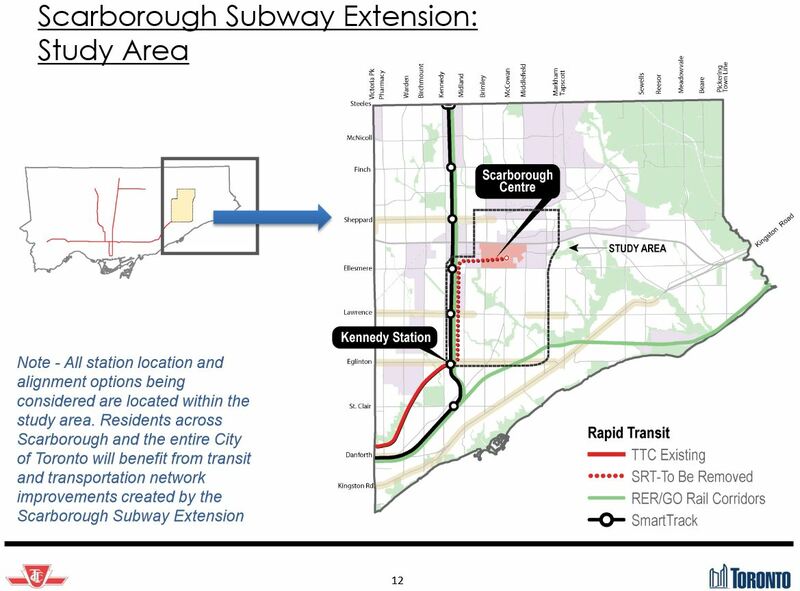 The Scarborough Subway Extension study to date has concentrated on the question of alignment with three possible routes surviving from a much longer original list. This exercise was triggered by concern that the nearby proposed SmartTrack service would cannibalize the SSE’s potential demand and that shifting the route to another alignment could improve its fortunes. Demand modelling played a big role in getting the SSE approved over the LRT network alternative, but Chief Planner Keesmaat has publicly suggested that the numbers used for that decision might not have been reliable, and they are no longer part of the City’s work. The obvious question now is whether there ever was sufficient demand to justify a subway option, and what the outcome of current modelling will be. This is not just a question of SSE numbers, but of future projections for other lines broadly linking eastern York Region to the core area. How will the demand distribute itself depending on which lines (and service levels) are in the model networks? What will be the effect of a TTC fare frequent service on SmartTrack as compared to a GO service of, say, 15 minute headways? The debate will come in 2016, but the moment there are “draft” numbers available, it would be surprising for them to be kept secret given the strong political opinions on both sides of this argument. With planning now well underway for the eastern waterfront including the Port Lands and the scheme to reconfigure the mouth of the Don River, not to mention development of the Great Gulf (Unilever) site east of the river, the question of access to what was supposed to be a “transit first” neighbourhood is back on the table. At the same time, there is some interest in transit to the western waterfront, a project that last saw any real action when David Miller was Mayor. To the east, the work is driven by new development; to the west, by a desire by residents along the waterfront, for a faster way to get downtown. A major problem with the waterfront is that it had few real political champions except when threatened by schemes for amusement park developments, and it shares with the core the problem that the waterfront is “downtown”, terra utterly incognita to more than a handful of Council members. Waterfront Toronto tried mightily, but its focus has been drawn to other major works (Queens Quay West and the Pan Am Village) while funding limited the scope of its work on Queens Quay East to basic infrastructure upgrades (water and sewers). The TTC has never been much enamoured of the eastern waterfront line in part because of concerns about concessions that would be made to competing users of the roadway. The Waterfront West LRT scheme goes back a quarter-century to the “subway in every borough” transit announcement by David Peterson in his failed bid to stay in office. It was always the poor cousin (a streetcar line, after all, does not have the political sexiness of a subway), and plans for this bumbled along pushed and pulled by many interests. The TTC built the Harbourfront connection from Spadina to Bathurst and rebuilt Fleet Street as a transit corridor as a first step, only to decide that this alignment didn’t really work for their plans which have shifted north to a Bremner Boulevard scheme of dubious value. Further west there are various alignments depending on which plan you read. The original scheme at the Exhibition Place was to swing south and serve Ontario Place, but that came to naught because Ontario Place preferred to keep its parking lot rather than gain a new transit terminal. Another scheme took the route north under the Gardiner Expressway, and the existing loop beside the GO station is a legacy of that alignment. (The original loop was further south where the “Enercare Centre” as it is now called is located. A planned underground transit terminal here fell through because nobody would pay for it.) From Exhibition Place westward, there are proposed alignments parallel to the rail corridor connecting to the existing network either via Dufferin Street to King, via a new ramp connecting to the Queen/Roncesvalles/King intersection, or further west via Colborne Lodge Road to The Queensway. The first goal any Waterfront West study needs to address is the question of just what demand it is supposed to serve beyond the level of a politician’s line on a map, and how it would relate to improved GO, SmartTrack or even a Western Relief subway line. To the east, a planned route would run from the Bay Street tunnel surfacing east of Yonge and terminating, initially, at Parliament. Eventually this would link up with a realigned Cherry Street and service in the Port Lands including a link to a proposed Broadview Avenue extension. Much of this is years in the future, but the key part, expansion of the station at Union and construction of the link east from Bay, has been a major stumbling block because of its cost. Work that might have been done while the station was closed for construction of the new subway platform went unfunded, and further upheavals await riders whenever expansion of streetcar facilities at Union gets underway. The estimated cost for the line to Parliament Street is $520m (2016$) of which $270m would be for the station upgrades and the new Queens Quay east tunnel, $100m for surface infrastructure and vehicles, and $150m for the reconstruction of Queens Quay East to the same general configuration as that we now see on the western side. Metrolinx wants to run many more trains on most of its corridors under the brand name of “Regional Express Rail” or “RER” with service as often as every 15 minutes, although this is a step back for levels of 5-6 minutes originally talked of in their plan “The Big Move”. Mayor Tory’s “SmartTrack” scheme arose during the election campaign as a modified version of a “Big U” scheme to link Milton with Markham via Union Station. The Tory version would run to the Airport Corporate Centre in Mississauga via Eglinton to the Weston rail corridor, and then follow existing GO trackage south through Union and then northeast on the Stouffville corridor. 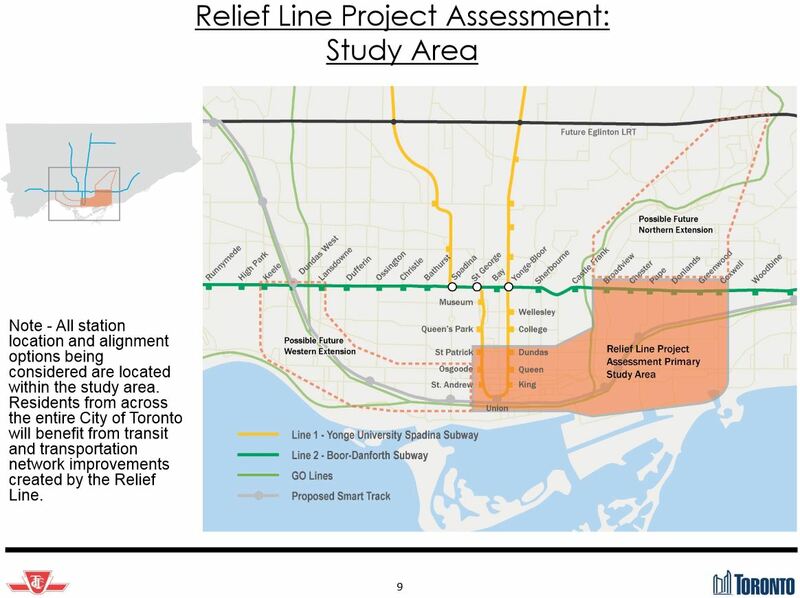 Metrolinx demand projections for the Relief Line study show little effect on the subway network from SmartTrack because it is too far away to do much good. Behind the scenes it is no secret that this conclusion did not sit well with the Mayor’s Office. Metrolinx has been and remains evasive on the question of SmartTrack service levels that would be constained by (a) the capabilities of their own rail corridors and (b) by the need to fit RER and other services into shared territory. RER is a major infrastructure plan for Ontario and its agency Metrolinx, and when completed, it will make a huge difference in travel around the GTHA. Whether and how SmartTrack actually fits into this is quite another matter. Metrolinx openly speaks of SmartTrack as if it is simply a supplementary GO service stopping at more stations, while the TTC talks of SmartTrack as its own operation with widespread integration of TTC services and SmartTrack stations. SmartTrack faces major technical hurdles beyond simply the question of service level notably the viability of the route from Mount Dennis to the airport via Eglinton West. The city is also studying alignments that would stay on the rail corridor to the point where the UPX spur branches off and then running south to reach the Corporate Centre lands. Financially, the SmartTrack proposal is little more than notes on the back of a rather worn envelope. Basically, Tory’s campaign said there will be “x” kilometres of line, and we will multiply by an average value for “overground” construction from London and Berlin (think of “overground” as an electrified GO line), and – voila! – we have a cost of about $8.3-billion. 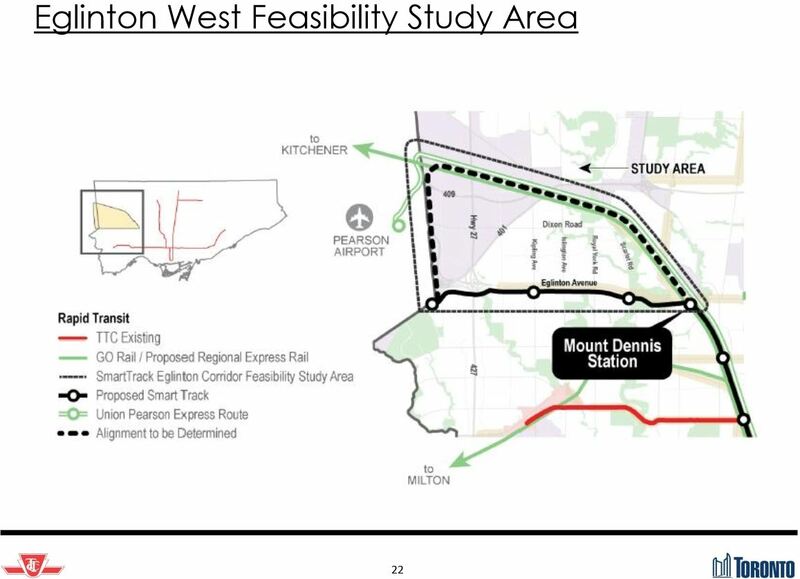 This did not include provision for the complex link at Mount Dennis, and it was unclear for some time whether the estimate included any tunnels at all. All of this would be paid for through the magic of tax increment financing (about which I will not burden you, gentle reader, beyond saying that snake oil has a better reputation for this project). At this point, we don’t know how where SmartTrack would go, how often it can feasibly provide service, what the fare will be, who will ride it, or how much it will cost to build or operate. Ridership numbers may come back looking great provided that trains run often and fares are at TTC, not GO, levels, but this could also have a high subsidy cost and may challenge the capacity of the GO corridors. Conversely, a less frequent service may “fit” within GO’s operations, but be less attractive to transferring riders who might face longer waits for a SmartTrack train than the benefit of a faster trip to downtown might provide, especially if this is at a premium fare. The Deputy City Manager neatly avoided these questions because all of the studies, including engineering analyses of various routes, are not yet complete. At some point, however, the pleasant fantasies will have to end and everyone – Mayor Tory, Metrolinx, Council and the TTC – will have to discuss how all of this fits together based on real plans and engineering, not campaign promises. 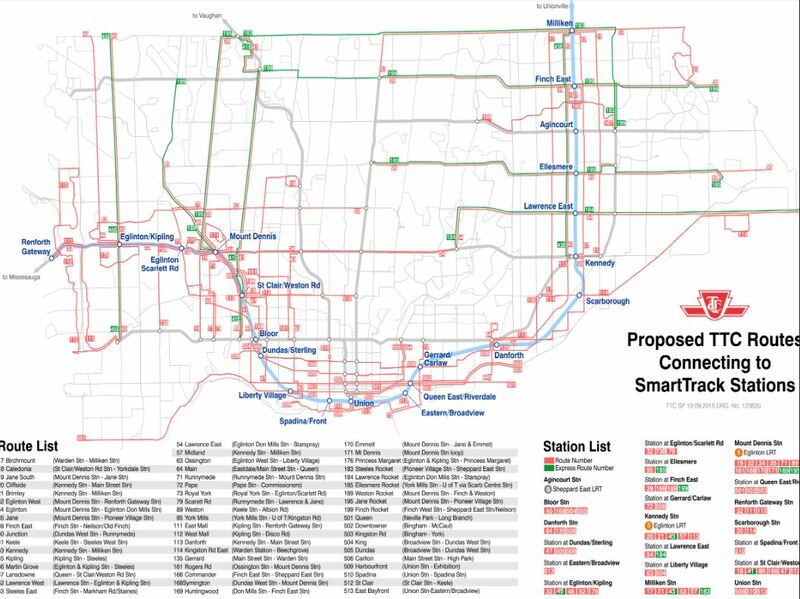 Are all of the SmartTrack stations actually going to be built? What will be the service frequency? Will SmartTrack actually be a TTC fare operation, or GO operation with some sort of premium fare + TTC transfer privileges? 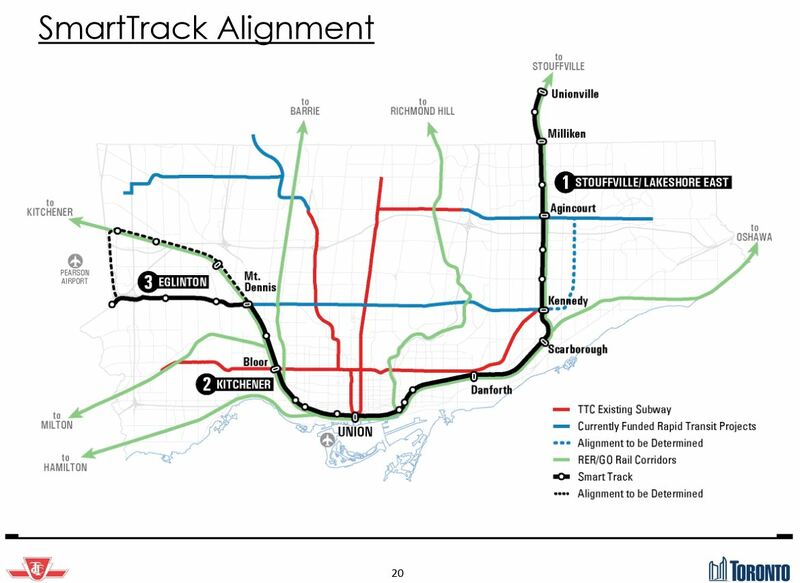 What alignment will SmartTrack actually take in northwestern Toronto? The Executive Committee meeting on October 20, 2015, should see a revised version of this update notably including some of the engineering evaluations of various alternatives that were not discussed here, but the picture will remain incomplete until the ridership simulations are finalized for meetings in 1Q16. Any action on the Waterfront lines is a longer-term issue because Council and the TTC must first decide what or even if they will pursue these projects before a work plan to update the Environmental Assessments and/or to proceed with more detailed design. Public consultation will occur in November 2015 jointly by the City, TTC and Metrolinx, but as with Council, members of the public will not have the full comparative picture because the demand studies will not be out yet. This could lead to “support” that is not fully informed by the final version of various studies, although how much attention will be given to such work by the current crop of politicians is anyone’s guess. Council and Toronto as a whole will move from debating lines drawn on a cocktail napkin to a detailed network proposal, and will have to face hard questions about the value of investing in every part of it. This entry was posted in A Grand Plan, Beyond 416, Downtown Relief Line, GO Transit, Scarborough RT/LRT/Subway, Spadina Subway, Transit, Waterfront. Bookmark the permalink. Why hasn’t Richmond Hill line been taken seriously as a Yonge relief line (With two more potential stations at Leslie-Sheppard and Ellington)? Steve: Two reasons. First is that this line requires considerable work to get it into shape for frequent service. Second, Metrolinx does not own the north end of the line and would have to negotiate frequent service with CN. As a resident living in Danforth Road for sixteen years Steve, I was surprised in regards to the Scarborough Subway extension project. You do realized a stretch of Midland, Brimley, McCowan/Danforth, and Bellamy between Lawrence and Eglinton are surrounded by residential homes. If they approve the alignment on Danforth/McCowan, that will spell some residential and health concerns such huge construction noises and drills. There was a amount of light to medium work since the city had just repaved Danforth Road between Midland and Lawrence/McCowan in 2012. Steve: As far as I care, Scarborough gets whatever upheaval it deserves thanks to insisting on the subway they “deserve”. Have you looked at Eglinton Avenue recently to see what subway construction entails? Of course I realize what the routes the SSE might take look like. You write as if you imply that I am responsible for this plan when I think it’s a steaming pile of crap. – 16 McCOWAN – Likely to be cut back to the proposed Danforth/Eglinton Stn. or otherwise unchanged. Could run parallel between Scarborough Centre Stn. to Eglinton. – 18 CALEDONIA – Resurrected but runs to St Clair West/Weston Stn. to Yorkdale Stn. – 19 JANE SOUTH – Splits the 35 route from Mt. Dennis LRT Stn. to Jane Stn. – 34 EGLINTON – Formerly 34 Eglinton East but extended west to Mount Dennis LRT Stn. – 35 JANE – Runs from Mount Dennis LRT Stn. to Pioneer Village Stn. 35D branch replaced by YRT 20 Concord. – 43 KENNEDY – New Express service. Will run North to Milliken Stn. rather than the existing Steeles-Midland-Passmore loop. – 54 LAWRENCE EAST – Rerouted to Don Mills and south to Science Centre LRT Stn. – 170 EMMETT – New route replacing the branch of 32. – 172 CHERRY STREET – could likely disappear after the 513 is deployed. – 183 STEELES ROCKET – Replaces 53E running from Pioneer Village Stn. to Sheppard East Stn. – 184 LAWRENCE ROCKET – Replaces 54E, which is extended westward to Don Mills to the Science Centre LRT Stn. – 185 YORK MILLS ROCKET – Replaces the 95E. – 189 WESTON ROCKET – new route. – 196 YORK UNIVERSITY ROCKET – discontinued post TYSSE or could coexist. – 198 UofT SCARBOROUGH ROCKET – Unchanged, originally a TC Scarborough-Malvern Line. – 199 FINCH ROCKET – Extended west to Finch West Stn. and follows east to Sheppard/Neilson rather than Scarborough Centre Stn. – 513 EAST BAYFRONT – Likely to replace the 172 or 72. So Steve, Don Mills or Victoria Park hasn’t yet implemented and Express service although the 195/198 were originally destined to become Transit City lines. Steve: Both Don Mills and Vic Park are proposed for Express routes (see the August 2014 Opportunities Report. The question is whether the city will fund the extra subsidy needed to provide the added service which has also been awaiting the arrival of new buses now on order. I really don’t see what your point is here. Reason 3: Union Station cannot handle the extra traffic. Reason 4: Railway operating rules would not allow more than 8 trains per hour. CN still retains operating rights over it so it must conform to transport Canada regulations. Reason 5: The route into downtown is poor as there is no connection with Bloor Danforth and it wanders too far east. Thanks for your informative comments about Richmond Hill line. Does anyone have the cost breakdown of Smart Track? Based on my research the cost of electrification and double tracking of Go train corridors is in average 15m per kilometre and I can’t understand how the cost of ST is estimated to be 8 billion dollars. Steve: According to Tory’s campaign people, the cost of SmartTrack was estimated by taking the current cost of “overground” line construction in London and in Berlin, adjusting for inflation and local conditions, and multiplying by the length of the line. There was no provision for tunnels, and they didn’t realize that one would be needed for the link at Eglinton West. It was very much a back-of-the-envelope job, but the number has stuck ever since. By the way, don’t forget that you have to add in stations and rolling stock. It’s not just a question of track and electrification. Given the investment that GO has in its current rolling stock, as Mapleson points out, I would bet that the initial electrification would be done with electric locomotive hauled trains on the core service while diesel hauled ones do the longer distances. As current rolling stock wears out or as more equipment is needed EMUs would be introduced. Steve: Yes, but if the project includes a substantial increase in service level, it’s not just a question of swapping out motive power. The question becomes – how much more service can they run on Lakeshore, and to what degree will they move the equipment from there to ramp up other services? Would it make sense that they would start to introduce EMUs on say Lakeshore, mixed with electric locomotive trains, even while they shifted cars to other lines? That would provide equipment for Kitchener and Stouffville as they are twinned, and for Barrie and Milton as they add service, while starting to move more of the fleet over. This would still leave Lakeshore with mixed EMU and electric Loco – but would represent the beginnings of a shift, and would bring them closer to being able to achieve higher acceleration rates – on the line that will need it most – although it does nothing for getting through the ladders. GO has 75 relatively new locomotives and 615 bi-level cars with more on order. If you have a 20% spare ratio for locomotives, 15, then that leaves 60 for service which could haul 600 coaches in 10 car trains or 720 in 12 car trains. Since some of the coaches would be in for servicing, especially the cab cars which are locomotives under Transport Canada rules, they have excess locomotives. The oldest bi-levels date from 1979 and have a lot of life left in them. Don’t expect a big change in equipment in the next decade, perhaps two. Milton will be problematic for increased rush hour and 15 minute base service as CP owns it and does not appear keen to let GO run more trains. Before Kitchener can have 15 minute service the line has to be four tracked as far as Woodbine where the UPE cuts off as there is not capacity to run any more service. There is only hourly service between the rush hours because GO trains cannot pass each other between the USRC and Woodbine. As Mapleson has said simulations show that the best bet is to double berth and terminate every train at Union, at least in the rush hour as this gives 8 trains per track per hour instead of only 6. Lakeshore would probably have some of its peak trains through routed and its base service as there is precedence and people who actually use it. Stouffville, Kitchener and Barrie would probably not see base service to the ends of the line as the demand would not warrant the extra equipment required. Richmond Hill has conflicts with CN north of the York Sub so RER on it is doubtful. Some EMUs will work their way into base service but it will be a long time before most of the local service is run with them, unfortunately. The ladder tracks will continue to be a bottleneck until GO schedules the platform allocation to minimize their usage. Milton: They seem, however, to be periodically getting CP to allow them to add a single train to this route, during peak, so to me that means in effect 12 cars and a loco spoken for, for each train. Kitchener: I was looking at UPX as its own beast, where the the 2 tracks belong entirely to it (what a waste), so 1 for Kitchener – hence twin tracking. I am in effect asserting that common sense says this should be a priority project, (or we should be stealing the track from UPX) in order to support the service. Again a run from Kitchener basically means an entire train set for every am peak run. If we add say 4 am runs, that is 4 more train sets, any added service (yes only a handfull possible) to Stouffville and Richmond Hill also bleed away trains sets – say 4-6 more between them. That would mean say a total of 10-12 train sets, plus a couple for Barrie. I think you could in the next couple of years make a case for 15 train sets, however, that would be enough to start looking at a real EMU fleet. Working to minimize the use of the ladders, and really having a platform allocation that made best use of Union is important, but really I am partly with Robert, we are not looking at creating enough space for wholesale replacement of existing fleet, without massive change in the USRC. GO has 75 relatively new locomotives and 615 bi-level cars with more on order. If you have a 20% spare ratio for locomotives, 15, then that leaves 60 for service which could haul 600 coaches in 10 car trains or 720 in 12 car trains. Since some of the coaches would be in for servicing, especially the cab cars which are locomotives under Transport Canada rules, they have excess locomotives. There is also (apparently) a large order of new cab cars that will start arrive in the near future – I’ve seen an initial unit sitting at Willowbrook – so the excess of locomotives won’t last long. True but GO has 10 tier 4 locomotives on order from MotivePower so that would give them 77 new locomotives. “CANADA: Greater Toronto transport authority Metrolinx has signed a US$63m contract for MotivePower to supply 10 diesel-electric locomotives for use on commuter services from 2016. I know that on weekends the FP 59s did not have enough fuel capacity to stay in service for the entire day. On weekdays there is enough chance to change trains off at the end of the rush hour so no trains stay out that long. GO’s fix was to have one locomotive provide tractive power and another provide head end power. They would always double head new locomotives during their initial break down period so I don’t know if they are doing it now for either of those reasons. One would hope that they got locomotives with large enough fuel tanks to stay in service all day. The other possibility is that some trains because of loading were having trouble keeping to schedule. The use of 2 locomotives would double the initial acceleration rate and make it easier to maintain schedules. They have ordered 67 cab cars and 60 coaches. That will give them a lot more cab cars than engines which is strange. The existing cab cars as far as I can find out number from 200 to 257 which gives 58 cars but 2 were sold to Trinity Rail Express in 1999 which leaves 56. This would give 123 cabs which is a lot more than the number of locomotives. Since these new cab cars have closed full width ends they cannot be used in mid train service as there is no passageway through them. Perhaps GO is considering shortening trains between rush hours; they could put an old cab car as car 6 and the new cab cars on the end of a full length train. This would allow them to shorten trains between rush hours but they abandoned this practice years ago because of the hassle and cost involved. They would need to have some sort of indication as to areas of the platform where the trains would stop as the accessible coach, number 5, has to stop at the raised platform. The 10 new locomotives have twin prime movers so perhaps they could pull a 6 car train using only one of the two diesels. Who knows what plans lurk in secret at Metrolinx? Milton will be problematic for increased rush hour and 15 minute base service as CP owns it and does not appear keen to let GO run more trains. Every time I hear this I am upset. Something so useful is being squandered. Compared with the two Montreal lines operated by CP, the Milton schedule is the pits. It’s about the same as the West Coast Express, (on CP in Vancouver) which has maybe 1/3 of the ridership. Hurry up and buy the line or build new tracks already. Since the beginning of railroads, Government has always needed to step in (with cash) to fund passenger services. It’s not going to get any cheaper and after 30 years of toying with the Milton Line you’re not going to get a discount, so let’s bite the bullet. I can teach Math and Physics but I apparently cannot add. It should be 67 new locomotives which matches the number of new cab cars at 67. This makes sense as they are both treated as locomotives under Transport Canada regulations and require a 92 day service (basically every 3 months). The question then becomes what do they plan to do with the existing cab cars, convert them into coaches or use them to shorten trains? Ontario cannot buy the CP line if CP does not want to sell; the line is federally incorporated, not provincially and the BNA act gave control over railways to the feds. There are a lot of places along the line where there is not room for more tracks and they still would remain under CP control. The only hope would be to build the “Missing Link” as reported in the Star. This line would run from the CP line between Milton and Trafalgar Road to the CN line just east of Bramalea. This would take CP freights off the line from the intermodal yard at Trafalgar to the point where the line joins up with the Kitchener line. The main problems is the connection from CN’s by-pass tracks, York and Halton, subs to the CP’s MacTier sub and Agincourt yard. There is a great vertical difference between the CN’s York sub and CP’s MacTeir sub. The map show the freights heading east to the point where the York Sub crosses CP’s Belleville sub then turning back west to get to Agincourt Yard then running across the North Toronto Sub, the one through the LCBO north of Dupont to get back to the MacTier sub. 4) it would not free up CP’s North Toronto sub for everyone’s pet crosstown line. Another commenter left a comment regarding “negotiations” to which he was enough in the loop to know about but not enough to be privy to. I figured a sale would be at least discussed. But you’re right, probably no sale, so onto those new tracks. How bad are the pinch points? Is it really impossible to put in more tracks, or just expensive? Also why would new tracks remain under CP control? Spacing differences aside, do we not have a good working model on the Lakeshore East for side-by side tracks? Also the (lack of a) crosstown line is another shame, in my opinion. Again, expensive to rehabilitate and widen but potentially very useful. Yes there’s a place for freight to roll through to the east coast, but there should also be a place for people since they’re the ones putting up with the shipments. About Agincourt yard, I thought I heard rumours about CP wanting to dispose of that property and build a new yard further east, far outside of the city. Not being too familiar with the local railways, if that were so, would the only remaining problem be access to the MacTier subdivision? I doubt that it is impossible if you are willing to spend the money to put in more tracks. The GO sub from Pickering to Oshawa is in a parallel corridor that existed between the 410 and the CN line. It helped that the province owned a lot of the right of way. I do not believe that there are any connections between the lines except at their end points. In the locations where GO has added tracks to CN, west end of Lakeshore and the Halton sub the tracks are under CN control because they were built on CN rights of way and have switch connections to the rest of the tracks. I believe the same would hold true for the Galt sub on CP. I hadn’t heard that but I believe that Hunter Harrison removed the hump yard facilities after he took over CP. The land would be quite valuable if it is not contaminated environmentally. I will check with a source I know. My source tells me that he has heard nothing about CP selling the yard but the hump track was taken out of service in 2012 and all the track removed. The only things still in use are the arrival and departure tracks on the south side along with the locomotive shops and rip (repair in place) tracks for cars. There really is not much left to replace. With so much material going in containers or in large blocks of cars the need for hump yards is greatly reduce. If CP could get someone to pay for a by-pass then the money that they could make from selling their main line from Pickering to the intermodal yard at Trafalgar Road would be worth a small fortune. The next problem would be CN’s demands to allow CP’s freights on their Toronto by-pass and the reaction from Markham, Vaughan and Brampton to having all the CP freights added to CN’s.